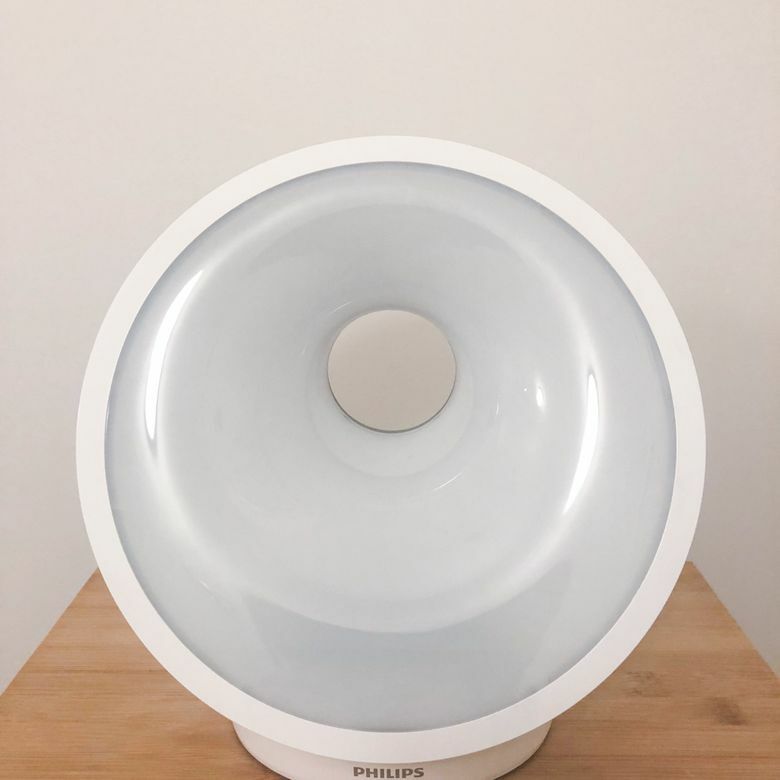 The Philips Somneo Light Therapy Lamp combines a sleek design and useful small amenities like built-in charging ports and breathing exercises to create a relaxing way to wind down before bed and wake up early in the morning. If you’re looking for a light therapy alarm clock with all of the bells and whistles, look no further. The Philips Somneo Wake-Up Light Alarm Clock is a frontrunner in the light therapy alarm clock market, coming with little perks like breathing exercises to help you wind down before bedtime and a charging port to keep your phone topped up while you rest. It’s one of the most costly light therapy alarm clocks, but if you want a bedside companion that doesn’t have any compromises, the Somneo is the one to get. At 12 inches in diameter, 8.8 inches wide, and weighing 3.2 pounds, the Somneo is one of the larger and heavier clocks to grace a bedside table. Its shape is odd as well. Most light therapy clocks put the time interface in the center and the light circles around this. The Somneo, however, retains this shape, but places a hole in the center and the time interface at the bottom. It’s odd, but not objectionable, making the Somneo look more like a modern designer piece than your standard bedside light. A quick note: the interface itself is easy to read, and adjusts to the room’s ambient light. The clock’s home interface is easy to navigate as well. It comes with a number of simple touch-activated buttons including a light switch, an FM radio feature, and the previously mentioned wind down option. The unique feature about the Philips Somneo is that it offers a “wind down” feature, which includes both a sunset simulation and breathing exercises. On the back, the Somneo has a USB port so you can charge your phone as well as a 3.5mm audio jack, which is nice if you want to listen to your phone’s music through a speaker. Perhaps its best feature is that the Somneo isn’t completely reliant on wired power — in the event of a power outage it has enough backup for eight hours and will beep for one minute if it knows that it will not last until the next alarm time. The Somneo comes with three components: the clock, an AC adapter, charging cable, and an auxiliary cord. To set it up, we simply plugged the adapter and the charging cable into the clock, and plugged the adapter into the wall. Setting up the clock, however, was a little more tedious The Somneo started by asking us to set the time. A couple of taps, and the time was set. However, it wanted us to go into the deeper settings immediately before reaching the home screen: brightness levels for the alarm, the time, the sounds and volumes, and breathing exercise routines. If you don’t read through the instructions or know it comes with a wind-down breathing feature, you’ll be confused as to why you need to decide whether you want to breathe four times per minute versus six. The Philips Somneo is a top-tier product in the light therapy alarm clock market. The unique feature about the Philips Somneo is that it offers a “wind down” feature, which includes both a sunset simulation and breathing exercises. Simply tap the wind down button, and then tap the sunset option, and the light slowly diminishes from a bright yellow hue, morphing to oranges and reds before it completely turns off. We like that the lights don’t suddenly switch off at the beginning and end — every light-related feature with the Somneo gradually fades and brightens. This feature also comes into play during breathing exercises, as it brightens as you breathe in and fades as you breathe out. If you want the light to stay on, you can use it in lamp mode to let it double as a night light or a bedside lamp. There are 25 brightness levels, but we noticed that while the Somneo is a great nightlight, the high brightness wasn’t quite good enough to be a lamp. You can read from it, but it’s just not an optimal bedside light. As we discovered the next morning, the same gradual light changes are available for the morning alarm. The light didn’t pop on, but gradually brightened. The Somneo ended up waking us up naturally a few minutes before the audio alarm sounded. It offers seven different audio options for the alarm itself, ranging from birdsong to soft gongs, but not your own phone’s tunes. Snoozing the alarm clock is very easy, too. Simply tap the top of the alarm clock, and the light will stay on while the music stops playing for nine minutes. To turn off the alarm, we simply pressed the alarm button on the interface, the music stopped playing, and the light gradually faded away. Because the audio is superb, we thoroughly tested the radio feature. The user can preset five radio stations, and can easily control swapping between them. We couldn’t flip back and forth between the options, but rather cycled through the other stations before coming back to the original. There is a volume section under the FM radio where you can easily increase or decrease it, though it was confusing to find at first. Once you become familiarized with it, though, it’s simple to maneuver. At $199.99, the Somneo is priced on the high-end for light therapy alarm clocks. However, you get what you pay for: great audio quality, gradual, subtle light changes, and more alarm options than most clocks on the market. We especially liked the radio preset feature as well as the auxiliary option for phone playback — an extra option nearly all other light therapy clocks lack. While pricey, the Somneo really boasts all the bells and whistles you may want or need. Compared to its cheaper sibling, the Philips HF3520 Wake-Up Light, the Philips Somneo’s extra features set it apart. Unlike the HF3520, the Somneo offers the breathing exercises, USB phone charging port, and a 3.5mm audio jack. However, the HF3520 has a lower price with many similar options, like five alarms with solid audio quality, and the same gradual light brightening and fading. The HF3520 similarly has a wind-down option, but not any USB or auxiliary ports. If relaxing before bed and charging a phone is a necessity for you, invest in the Somneo, otherwise, the HF3520 can save you some money. Still want to browse some other options? See our article where we outline the best light therapy alarm clocks to buy today. Relaxing, but it’ll cost you. With unique features and great audio and light quality, the Philips Somneo is a worthwhile investment for anyone who wants to add to their relaxing bedtime or wake-up routine. However, if price is a major factor in deciding between clocks, it might be best to pick a cheaper option. Product Dimensions 12 x 8.8 x 4.7 in.